Another possible DMSP/SSMI sea ice sensor failure? | Watts Up With That? Another possible DMSP/SSMI sea ice sensor failure? Not only was the glitch I pointed out part of the sensor failure real, there was also a long term drift in the sensor readings. Cryosphere Today followed soon afterwards, pulling the plug on their data plot. This image below is what prompted me to bug NSIDC about the issue, the downspike was highly atypical of the dataset. The glitch seen above turned out to be a “catastrophic failure” of the SSMI sensor on the Defense Meteorological Program (DMSP) satellite that NSIDC (and many others, including Cryosphere Today) also use. Here’s a look at the problem in more detail that WUWT covered in June. That is due to DMI choosing to plot “where areas with ice concentration higher than 30% are classified as ice”, while NSIDC, CT, and JAXA plot an area with at least 15 % sea ice. So the absolute difference isn’t what concerns me, it’s that darn glitch again. NSIDC and CT have taken steps to filter out such things in their own records. DMI obviously hasn’t. The fact that such abrupt downward glitches are still observable in the DMSP SSMI data makes me concerned for the integrity of the dataset. In May 2009, NANSEN also had problems with SSMI data. So the biggest names in sea ice data on the web, NSIDC, Cryrosphere Today, NANSEN, and now DMI, all of which use SSMI data, have had problems with it. The IARC-JAXA data has held steady. This is why I prefer using the JAXA AMSRE data from the AQUA satellite to look at current and recent history sea ice events. The newer AMSRE sensor has not shown any such errors, drifts or glitches during its history. It would seem to me that the time has come for these agencies to consider switching to the more reliable AMSRE/AQUA platform and splicing the older SSMI data set with appropriate considerations to make an accurate longer term record of sea ice since 1979. October 14, 2009 in Arctic, Sea ice. Mr Hadow said that future expeditions to the Arctic in summer would need to change their techniques and equipment to cope with more frequent stretches of open water. Mr Hadow said that he had decided to change the focus of his polar expeditions from exploration to collecting data that could help to predict changes in the climate. 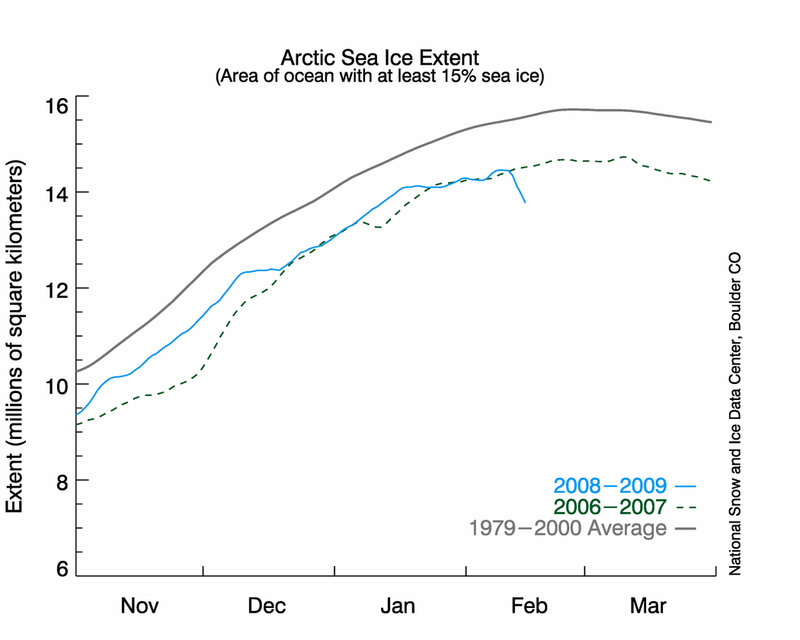 Has anyone noticed that Arctic ice was pretty constant from 1979 until after 2002 or so? Then it started to drop off rather quickly. This is kind of odd. 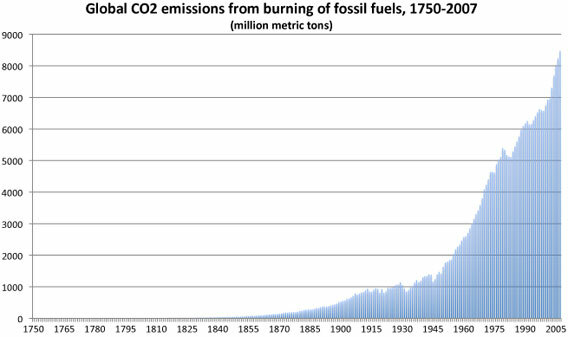 Both land and ocean surface temperatures rose from 1979 to 1998. Ice seems to be doing the opposite of what the temperatures have done. Of course, many other factors than temps affect ice extent. Perhaps there have been some glitches with ice and climate tracking which result in false trends of cooling and/or ice expansion but I have the impression the glitches are essentially always depicting greater warming and ice loss. Where is the glitch which over stated se ice extent? Or the carry over of one month’s temperature to be used for the next (in the spring) which distorts to the cool tracking to cool side? DMI is Danish, not Dutch. Yes, the intergalactic radiation is killing the sensors. This outfit use SSMI data from Nansen, but don’t seem to be showing any glitch at the moment. Arctic Roos has a date on the lower left of their graphs. They only show through 10/13/2009. DMI also is dated and is showing 10/14/2009. We’ll see tomorrow if Arctic Roos stays on the 13th or updates with possibly corrupt data. Anthony, that sudden drop in Arctic temperatue is probably real. That cold air dropped down to Minnesota this week instead! Sue and I were able to get out onto the lake three times with the new sailboat this year and were learning rather rapidly. Sue insisted that we spend one weekend getting our home ready for the winter, so we got busy doing that important task. The restaurant has a two deck party barge that makes a 2 hour trip around the lake several times a day. On their return to the dock, they cut it a little too close to my sailboat and the rope between my mooring buoy (only 20 feet long) wrapped around the barge’s propeller! The barge lost all power and was still connected to my sailboat by that rope, in a rather strong wind, so this situation rapidly became a major emergency! They called for help and got a boat to tow the barge back to the dock, but in the process, they had to cut my sailboat loose. Obviously, the barge must have absolute priority with it’s passengers and they were able to keep everyone safe. They were then able to capture my drifting sailboat before it hit anything solid and safely tow it to another dock. With a keel, finding a dock that could handle a sailboat was not easy, but they called around and located a dock on the other side of the lake. Now, my sailboat was safe and sound. The restaurant had lost my name and address, so they had no way to contact me! For over a week, I had no idea what had happened. Last Thursday, they were able to send divers down to retrieve the anchor chain for the mooring buoy (the barge snapped the chain) and tow my sailboat back to where it belonged. Friday, I had the day off from work and sailed the boat all alone for the very first time. Trying to control such a large boat without any help was rather scary, but I was darn proud of myself when I was back on my mooring buoy. This was not easy, since I had to plan my navigation from almost 1/2 mile away and make the approach “close hauled” relative to the wind. When I “kissed the buoy” after a precision approach, I then let the main sail loose, snagged the mooring rope in the water, ran forward and tied it the the bow of the boat, and then lowered the sail on my way back to the cockpit. As an airplane pilot, this was almost exactly like flying a pattern around an airport for landing, but even I was impressed when the boat halted with the bouy next to me and all I had to do was reach down and grab the rope. Saturday morning, it SNOWED! In all recorded history, Minnesota has only had snow before 15 October seven times. This was rather shocking! I woke up with snow on the ground and a temp of 27 deg F. Our trees were just as stunned! Between 8:00 AM and 10:00 AM, my walnut trees dropped all of their green leaves. Seriously, these trees were dumping everything and were totally bare two hours later. Nobody has ever seen trees drop GREEN leaves and this has caused another rather interesting problem. Green leaves do not mulch (just clogged the mower) and we have no idea how to deal with this rather unusual problem. It snowed once again Sunday evening! Darn “Global Warming!”…. Sunday, I was on my sailboat in 34 deg F weather, because this was my last time before the winter ice. This turned out to be rather amazing. Most people took their boats out of the water after Labor Day, but when the snow hit on Saturday, everyone else had their boats out of the water, except me. All alone on a 8 mile diameter lake. No motor and the only sound was from my inflatable dingy being towed 100 feet behind my sailboat. It was very cold on deck with the wind-chill, but down in the cabin, it was rather nice. After tying the tiller with a rope, the sailboat was perfectly balanced and sailing on it’s desired course without my supervision. I would stick my head out of the cabin every few minutes to insure that everything was correct, but most of the time, I simply sat in the cabin and enjoyed a warm cup of coffee. With nobody else on the lake, I did not have to worry about any other boats. That will never happen again, but for one brief moment in my life, God “kissed me” in a way that I will never forget. I don’t think I would call that a glitch or a failure… I could call it a sabotage. 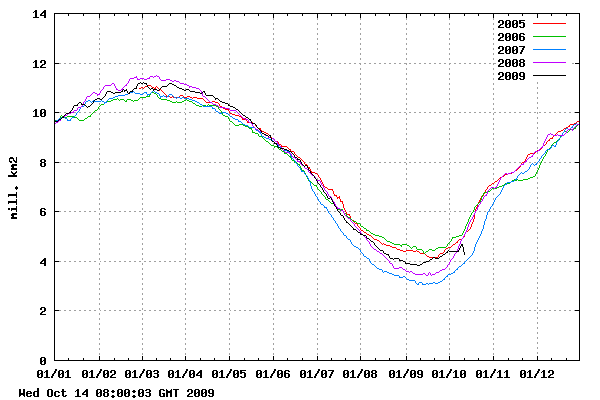 Someone needs to move the line below last year’s recoding or else it could not show that the arctic is melting! Yes. Another one bites the dust. Must be quite the stream of stuff hitting the polar orbits. The North Pole will turn into an open sea during summer within a decade, according to data released Wednesday by a team of explorers who trekked through the Arctic for three months. The Catlin Arctic Survey team, led by explorer Pen Hadow, measured the thickness of the ice as it sledged and hiked through the northern part of the Beaufort Sea earlier this year during a research project. Their findings show that most of the ice in the region is first-year ice that is only around 1.8 metres deep and will melt next summer. The region has traditionally contained thicker multiyear ice, which does not melt as rapidly. “With a larger part of the region now first-year ice, it is clearly more vulnerable,” said Professor Peter Wadhams, part of the Polar Ocean Physics Group at the University of Cambridge, which analyzed the data. Martin Sommerkorn of the World Wildlife Fund said the Arctic sea holds a central position in the Earth’s climate system. “Such a loss of Arctic sea ice cover has recently been assessed to set in motion powerful climate feedbacks which will have an impact far beyond the Arctic itself,” he said. Global warming has raised the stakes in the scramble for sovereignty in the Arctic because shrinking polar ice could someday open resource development and new shipping lanes. The rapid melting of ice has raised speculation that the Northwest Passage linking the Atlantic and Pacific oceans could one day become a regular shipping lane. The results come as negotiators prepare to meet in Copenhagen in December to draft a global climate pact. Is it any coincidence that Copenhagen is in Denmark? I think they will be very reluctant to do that. You only need a cursory look at the SSMI records from the eighties and nineties to see that they overestimate summer ice. For example they regularly show ice in the Baltic and the White Sea in July, when these seas are invariably ice-free. It’s interesting to compare the AP “North Pole summers ice-free in 10 years” story (given headline prominence by a reverting to type BBC this morning) with the 6 October NSIDC press release that reported that “Second-year ice made up 32 percent, compared to 21 percent in 2007 and 9 percent in 2008”. NSIDC Scientist Walt Meier commented, “We’ve preserved a fair amount of first-year ice and second-year ice after this summer compared to the past couple of years. If this ice remains in the Arctic through the winter, it will thicken, which gives some hope of stabilizing the ice cover over the next few years”. But, there again, perhaps we shouldn’t overlook the real polar ice authority: early this year, Al Gore warned us that “the entire north polar ice cap may be gone in five years”. Seriously? One of the most visible failures in scientific research is making claims about ice-free summers? How bad do you have to fail in order to not be taken seriously? Please bear in mind that the algorithms for calculating ice extent varies between the different monitoring institutions. There might be differences in grid-cell size, what percentage of ice in a “pixel” to count as ice, etc. With regards to the Catlin team report, the outcome is very unsurprising indeed. After all this is what they were determined to “proove”, and I suspect no observations or real world data would lead them to conclude otherwise anyway. It would therefore be interesting to revisit the data collected by the Alfred Wegener institute by plane (Towing a particular Radar(?) sounding unit(?). I suspect some of the claims made by the Catlin team could be challenged by proper data. Fox online is now running the news piece on an ice free arctic with reference to the Catlin survey from Reuters. I just dropped their news manager an email pointing them to the Catlin survey saga coverage featured here when it was happening. It will be interesting to see if they follow up with an article that mentions the German aerial survey and the “issues” Hadow had during their trek last year. Anthony…. Did you contact Walt Meier, like last time? He seemed a pretty good guy. I quite like them using different sensors/satellites so we can spot the problems better! The Catlin Ice Survey was an unscientific publicity stunt (in my opinion) and I am amazed that anyone would seek to deduce or imply anything from their findings. After all, their’s was the first survey of its (ludicrously amateur) kind, all their mechanised measuring equipment broke down and they had to rely on measurements made by hand augur here and there while they were not huddled in their tents worrying about freezing to death. We will need to send another bunch of WWF-and-Climate- Change- Insurance- Agent- funded non-scientists out their next year to make some more measurements in order to obtain any possibly meaningful information, surely? Or am I hopelessly misguided? I am not a scientist but it does seem fundamental otherwise one is not comparing like with like. I wish I could find a bookie taking odds on an ice-free summer Arctic in the next ten years. Perhaps I shall offer Professor Wadhams a bet. Some people would call this paranoid, but not me. I agree with you. So much scientific data is now [questionable] that those handfull of desperate warmist need to stoop to all kinds of underhand tactics to keep the money flowing. We are heading for a new ice age and they fiddle the data! Yes what kind of people would widely boast of a major scientific survey and widely anounce the results before it was ever peer reveiwed, appearing on news shows and the like. Such un scientific amatuerishness. Luckily we have a blog like Watts to keep us informed of the real science, and his survey of US weather stations. Antony shows his true metal by not repeating what Catlin have done and appearing in the news discussing unpublished data. Sky News in the UK this morning interviewed Pen Hadow the renowned arctic explorer and in a cosy admiring interview we were told that his expedition and scientific measurements had revealed that the arctic was declining far more rapidly than first thought and would be virtually ice free within ten years. Apart from the fact that he was not singing from Al Gore’s songsheet and my awareness of the pathetic inadequacies of his ill starred egotrip, I was struck by his startling facial likeness to Tony Blair and by the same look in his eyes as he tried to convince the viewers that AGW was a real and immediate threat, just as did Blair with his weapons of mass destruction. More hockey sticks, inverted or otherwise. They’ve lost one, what’s wrong with trying to fool the masses again? How do we know that the ice sheet records of 1979 are correct? They can be just as faulty as the glitches from this year show. change with improvements in the overall ocean state is expected. The product line remains the same as before. planned upgrade of RTOFS-Atlantic production next month. Anthony, do you know something? I have a simple question…please pardon my ignorance. Is this the same satellite/sensor that provides the Arctic temperature measurements displayed on the righthand bar up above (http://ocean.dmi.dk/arctic/meant80n.uk.php)? If so, could these sensor problems be behind the weird Arctic temperature readings as of late? Once again, sorry if this is a dumb question. I guess it’s possible that the data is correct, but the form of the curve looks different this year when compared to the last 10 years or so of data that I looked at. Ooops, a little heavy on the homogenizing there, I’ll just type in some new numbers in the model and it will look more plausible. Sorry. What do the maintenance and data quality people do? I assume as long as the trends agree with the grant money, nothing. But the real kicker is that the older than 2yo ice has dropped from 52% to 19%, that’s a major change. The younger ice flows more easily, it’s flowing out of the Fram at a good clip now, hence the tongue of ice down the E Greenland coast, that is mainly 2+yo ice which will be gone next summer. An excellent point IMHO. “Faulty” or not, at least there is more than one source for data. I believe the word is “weighting”? Just a completely random and irrelevant thought: Perhaps arctic sensors and satellites appear to be sentient beings, and a Vogon is reading poetry to them, and they are self-destructing in an attempt to make the pain stop. Likewise, all though I also use CT because I prefer area over extent and that has a longer history. CT changed to AMSR_E anyway but have apparently done a splice for their comparison page (although I don’t use that often). NSIDC switched to the other SSMI satellite and appears to be OK since. After ArcticROOS did their switch it looked too erratic to me so I haven’t used it in a long while. I read with great mirth Steve H’s tale about losing his sail boat. I suspect he’s off on Lake Minnetonka, about 2 miles from where I live. What he didn’t mention (I will) is that the smaller lakes and ponds now are having an ice layer on them. That is rather ODD for MN this early. Today it is rain and snow. I’m looking out at trees covered with GREEN leafs! Apparently the cold has come on us so fast, that it has “locked” the leafs on the trees, “frozen” them, as it would be, at the late summer early fall stage. Now for the kicker – – – this is being blamed on a deep jet stream pull, bringing down an ARCTIC AIR BLAST. That downward trend has been corrected in the interesting form of an upward squiggle. Perhaps arctic sensors and satellites appear to be sentient beings, and a Vogon is reading poetry to them, and they are self-destructing in an attempt to make the pain stop. And hooptiously drangle me with crinkly bindlewurdles, or I will rend thee in the gobberwarts with my blurglecruncheon, see if I don’t! Now you’ve done it. My CPU just tried to escape so it could throw itself off the balcony. I’ve actually heard people who can talk like that for three hours straight; they do it all the time on “Coast to Coast AM” that evolved out of the Art Bell Radio show; now hosted by George Noory. They rattle on about Harmonic Convergences, and other tripe; and they do it in such a way, that half the time, I can’t tell if George believes a word of it or not; same goes for some of his other hosts that do the program on the weekends. Sometimes you even can read that stuff here on WUWT; and it even gets followed by other visitors. George E. Smith, I hope you’re not quoting my favorite Vogon piece in order to mock it! I have oft longed again to experience crinkly bindlewurdles. And nobody, NOBODY can take away the breathtaking enjoyment of micturation. I’m currently working on downloading the data from ASMR-E. It’s in a nightmarish format from the NSIDC which forces you to download 50mb files for each day and separate the part you want out using an asinine data format invented for ‘data sharing’ it’s a nightmare. On this upcoming Sunday the Air Force is planning to launch DMSP F18. The launch time is set for 9:12 am PDT. It will launch from Vandenberg AFB, CA and head south over the Pacific. Anyone on California’s central and southern coastal areas should have a good view. It appears that the weather will be very nice and visibility should be excellent. last time I saw THAT word was in Billy Bathgate. Ranks up there with “caprophagous”… which is my considered and erudite opinion of catastrophic warmers in general and RC commenters in particular. between the ice chunks and the cloud cover. No update for http://arctic.atmos.uiuc.edu/cryosphere/ since Oct 11.